DIY Lemon Scrub - Smells SO Good! Whether it’s winter or summer, my skin is always dry and in need of extra moisture. The dryness of the winter months and the added sun exposure during summer both don’t help my complexion. I have been a fan of coconut oil for cooking for years now, but now swear by using this versatile oil for my skincare as well. Coconut oil contains anti-bacterial and anti-fungal properties, which may be beneficial for acne as well. The moisturizing aspects of coconut oil are amazing and I love that your skin doesn’t feel greasy or weighed down after each application. I wanted to share my favorite skincare uses that can be done year-round, which is why I’m totally obsessed – especially during summertime! After Sun Care – With living in Florida, I do tend to get some sun exposure and even sunburn after a few times of being out on the beach. Nothing is worse than having a burnt forehead or nose! If I do get sunburn, I turn to applying coconut oil to the affected area every hour for added moisture. Coconut oil is also a good anti-inflammatory agent, so the puffiness seems to get reduced with each use. 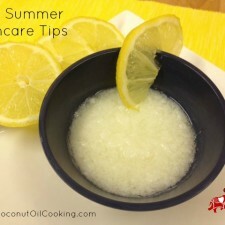 Visit this blog for my sunburn relief tips. Make Up Remover – Anytime I would use store bought make up removers, my eyes would burn so bad and turn red. It got to the point where I couldn’t handle it anymore and then thought of using coconut oil! Believe it or not, this has been the absolute best make up remover. Simply put a dab of coconut oil on a cotton ball or pad to remove make up. This works especially well for heavy mascara, dark shadows and even red lipstick. Try these vanity swaps next time during your beauty routine! Acne Treatment – Even in my mid-twenties, I still suffer from acne. No matter what I do or what products I use, it is still there. One of my co-workers tried this oil cleansing method each night before bedtime and saw some improvement, so I have taken on the same routine as well. The anti-bacterial properties which are found in coconut oil may help with excess dirt in those pores, so it’s worth a shot! Be sure to check out this blog for more acne remedies. Exfoliation – Whether you’re trying to get rid of peeling from sunburn or just want smoother skin, making your own exfoliation treatment is the way to go! 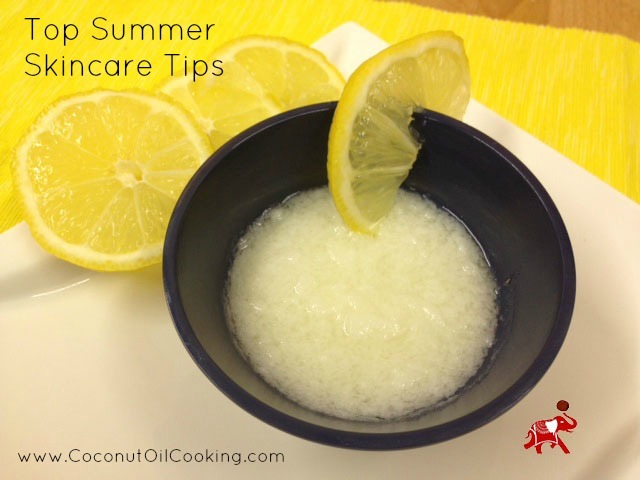 I’m obsessed with this DIY lemon scrub that is perfect for summer! You can omit the soap that’s that recipe or add in your favorite face wash instead. Lips – Even during summertime, it’s important to not neglect your lips – they need added moisture, too! My lips get really bad if I’m out in the sun too long and then I tend to feel like I’m shriveled. You can either apply straight coconut oil or make this DIY lip balm for added moisture and relief. I hope that you’ll be able to use some of these tips on your face all year long for added moisture and as an all-natural way to stay fresh!